If you've been with Virgin Media/Telewest/NTL cable, and never used ADSL before... this page is for you. Virgin Media will supply you with the Cable Modem. You will probably have selected your own Broadband Router, or you'll be using one supplied by Virgin Media. To make the switch you'll need a plain old telephone line. You don't have to buy this line from BT, see this page for more information about the alternatives to BT line rental. You don't have to terminate your account with Virgin (though you may wish to discontinue their broadband service). You can transfer your existing telephone number. Virgin Media's customer services number is 0845 454 1111. Note that Virgin may attempt to offer you discounts to stay, be prepared to insist. Think about overlapping the period of transition (so you can ensure your new ADSL service is operating reliably). Choosing a new ISP isn't difficult... there are some of my recommendations here. Your new ISP will help you make the transition; it is in their interest to make it as easy as possible for you. 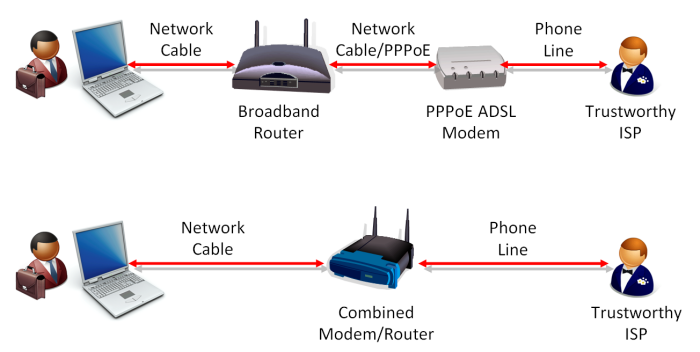 The Cable Modem is replaced by a combined Modem/Router, or simply a PPPoE ADSL Modem. My preferred supplier is BroadbandBuyer.co.uk, they can supply Combined Routers and PPPoE modems (such as the Draytek Vigor). Though it is possible to connect your computer directly to an ADSL or Cable Modem, I would not recommend it. You should always use a Router for added security. Good luck. It is not as difficult as you might think... and the quality of service from the smaller ISPs is often excellent. ADSL is very reliable, and performance is excellent. See also the article "Moving Away from Cable; Advice for VirginMedia Customers" on BadPhorm.